Have you ever seen a video showing someone making contact with what looks to be a liquid, only for it to respond like a solid would? Yeah? Me too! I know that this is known as a non-Newtonian fluid, but that’s about as far as my knowledge goes. I’m interested to find out more about how this substance. I can make a few speculations regarding the fluid however. I think it gets its name – non-Newtonian – from the fact that it doesn’t follow at least 1 of Newton’s laws. This would make sense as it is known for being a substance that is out of the ordinary. After researching about non-Newtonian fluids, I have learned how they work, and how they differ from regular fluids. 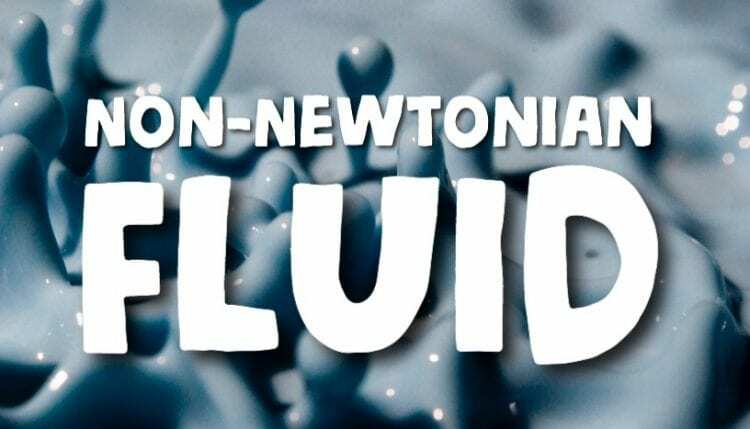 First off, a non-Newtonian fluid, like it’s name entails, doesn’t follow Newtons laws of viscosity. The viscosity depends on the shear rate, or shear rate history. This can all get very sciency and hard to understand, as the topic to begin with deals with something that isn’t a solid, liquid or gas, which as children we are told all things are. Basically, when force is applied on a non-Newtonian fluid, instead of staying in a viscous state as a regular fluid would, it turns in to a solid. It’s really weird and is crazy to think a substance could just switch states in the matter of seconds. There are many examples of non-Newtonian fluids that you may have in your house. Such as ketchup, honey, shampoo, toothpaste and more. After watching this video we can get a better, visual understanding of a non-Newtonian fluid being tested. This video is filmed in extremely slow motion, 1600 frames per second to be exact. As music is played out of the speaker, the fluid switches from a liquid to solid state very quickly. Because the speakers are moving so quickly with such force the fluid can stay in solid state for longer. I really love this video because of the scientific content and the incredible filming. To finish off this post I’ve created a little quiz-type game; two truths, one lie. I have listed three statements regarding non-Newtonian fluid, and your job is to guess which one is the lie. Good luck! A: Non-Newtonian fluids do not follow Newtons laws of viscosity. B: Non-Newtonian fluids turn to gas when force is applied on them. C: Toothpaste is an example of a Non-Newtonian fluid. Which answer is the lie? Leave your answer in the comments below! I think B is the lie. Hi Mrs. Wohlafka, great guess! Hi Daniel, I am Jason and I think your blog on Non Newtonian Fluid blog is great. I learned some new things I never knew before so keep up the good work. Also for your quiz I chose B as my answer. Please come check out my site at 2024wangj.edublogs.org. Thank you Jason, I appreciate that. Your answer for the quiz is correct, great job. Thanks for leaving the link to your blog I’ll be sure to check it out! Hey Caden, thanks for reading through my blog even though you couldn’t watch the video. Also, your answer for the quiz was correct! Thanks for recommending those YouTube channels, I’ll be sure to take a look at their videos as well as your blog. Hi, my name is Pierce and I wanted to say think you really quick, because I’ve been too lazy to research this for myself ◔౪◔. I believe that the reason it instantly turns into a solid is because instead of the molecules moving around the object that is dropped into it (like what happens with water) the molecules stay where they are and are compressed, creating a solid. But hey, that’s just a theory, A GAME THEORY! The answer to the quiz is B. I hope you will come comment on one of my blog posts at 2024pae.edublogs.com.